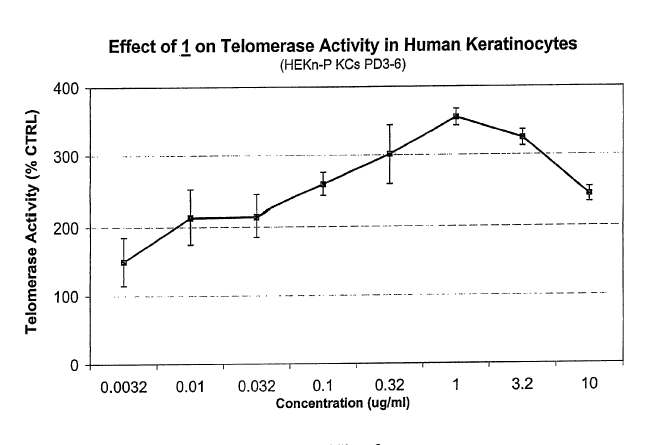 At last, we have a well-designed study showing TA-65 lengthens telomeres in human subjects. This was a double-blinded (patients and researchers not aware what substance was taken), placebo-controlled (half were given ‘inactive’ substances), randomized controlled trial (assignment to treatment at two doses versus non-treatment was done randomly therefore minimizing the risk of unknown confounding variables). The study was small but that is only a problem if you don’t find something. 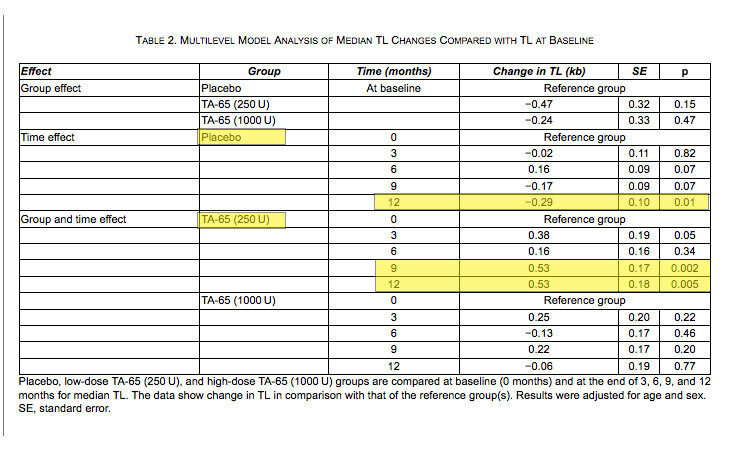 In this case, findings did reach statistical significance for the low dose TA-65 and control groups. The study was conducted on 117 relatively healthy Barcelonian cytomegalovirus-positive subjects aged 53–87 years old. 22 subjects received four TA-65 capsules, each consisting of 250 U of TA-65 (i.e., 1000 U/4 capsules). Fifty-two subjects received four placebo capsules. Here are the results from the 20%ile of telomeres, indicating even more significant (lower P values) finding associated with the DISTRIBUTION of telomeres. 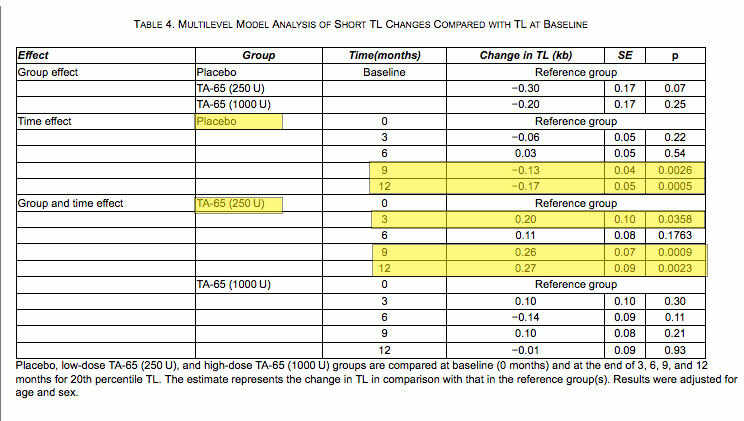 In other words, the net change in the 20%ile decreased for placebo users and increased for the low dose TA-65 users. This study focused on CMV-positive subjects of an older group because a previous study had suggested this group of individuals have significant changes when exposed to TA-65. There may be some suggestion that the higher dosing was less effective and indeed, data from the patent application also suggests diminishing returns at higher concentrations. So is less really more when it comes to taking TA-65? That is what this study would indicate! As far as clinical effects, I seem to notice more prominent effects of higher doses as measured by heuristics such as sleep changes, mood, recovery, and exercise. Although the current data do not bear this out, I believe that higher doses may be activating more apoptosis and therefore causing loss of both very long and short telomeres. I know that one of my worst patient results became the best after high dose TA-65 as I blogged about here. Knowing what we know about the importance of telomeres in maintaining health and longevity and given the safety of this supplement, would you consider spending $2,000 for 7 years more length on your biological clock? If you would like to know what you telomere measurements are doing while taking TA-65, please contact Susie@rechargebiomedical.com to pre-order a Life Length testing kit now. Life Length was the company that conducted the above study which was paid for by TA Sciences, although the blinding was secured. There is a Spring promotion through the end of April, 2016 and the cost has dropped nearly 65% and for a short time, will be same as other simpler technologies. I’ve been waiting for this a long time, thank you! My question now is the one I always have that all double-blind placebo studies seem to leave unanswered, due to the standard protocol. What happens three months later to all groups, once treatment is stopped? The reason this is important is that our bodies tend to be adaptive. In some cases, like with caffeine, for example, a tolerance is built up. While improvement in mood and performance will show success in the studies, once caffeine is discontinued, the mood and performance will be worse afterwords in the group that first showed improvement. Is it possible to follow up on these individuals now that some time has passed? Good question although the mechanism is non-adaptive. The DNA is literally being lengthened so that is not impacted by mileau presumably. Wow. This study is fascinating, but it raises more questions than it answers, particularly with regard to cytomegalovirus. This seems to be the elephant in the room that no one is talking about. So much for the naysayers that predicted that it wasn’t possible oe too good to be true. I achieved better than expected results with TA-65 including white hair turning black. My wind or aerobic capacity dramatically improved. There was sexual health benefits that were noticeable. My attitude improved to the point that small obstacles did not stall me from task completion because I no longer procrastinated. Did my telomeres lengthen? I don’t know because I didn’t measure them before or after. My sleep was deeper and I awoke refreshed. After six months of two capsules a day I had to pause due to financial reasons. I will return to its use as soon as possible.